Published: Nov. 14, 2014 at 03:09 p.m. Updated: Nov. 14, 2014 at 03:24 p.m. The NFL changes in an instant, which is why it's important to stay abreast of how your players are looking prior to Sundays. This is especially true this week as we have six teams on a bye (again), and a number of marquee players dealing with, or returning from injuries. Below is a look at whose stock is rising, and whose is falling, as we approach Week 11. Keep an eye on these players heading into Sunday to help make the right choices for your fantasy lineup, as their stock could be on the move again before kickoff. Bernard has yet to practice this week, and NFL Media's Albert Breer reported earlier this week that the team is expecting to be without Bernard for their Week 11 game against the New Orleans Saints. This would mark the third straight game the superstar running back has missed, paving the way for the rise of the next player on this list. 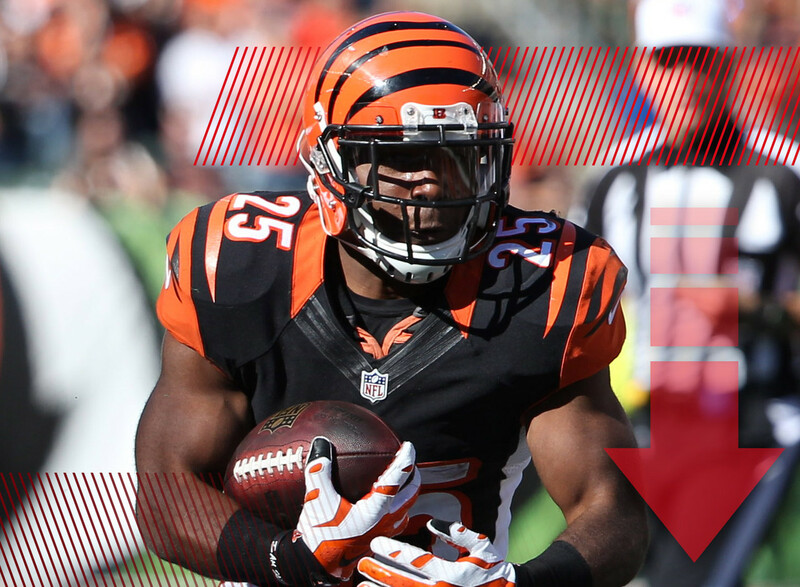 Hill has had a two-week run as the uncontested starter in the Bengals backfield, and is the sixth-highest scoring running back in fantasy during that stretch (despite his 4.10-point effort last week). The Saints aren't particularly stalwart when it comes to stopping the run, and if the Bengals want to have any hope of winning on the road they'll need to have Hill churn out some yards and eat up the clock to keep Drew Brees on the sideline. For some reason, even though his offensive line is improving, McCoy has still struggled to get going. He had 19 rushing yards on 12 carries last week, and the only reason he was a moderate fantasy success was because of a gift of a 1-yard touchdown. The Packers have been weak against the ground game in 2014, but McCoy hasn't been able to exploit matchups to much effect this season. He's still worth starting this weekend, but until he proves otherwise, his stock is on the decline. While Shady's stock is falling, Sanchez's stock is rising. Many doubted his ability to deliver as a starter, but he played very well in a blowout win over the Carolina Panthers last week in his first start since 2012. Sanchez has a tough matchup against the Packers secondary this week, but if he can deliver yet again he'll be earning even more fantasy attention. The Vikings' frustration in Patterson seems to be reaching a tipping point. Here's a direct quote from offensive coordinator Norv Turner about Patterson's struggles and inability to get open: "We completed 26 balls (on Sunday). I don't care who they go to." Yikes. Unless Patterson can turn things around in a hurry, he'll be putting a depressing bow on one of the most disappointing fantasy seasons in recent memory. The Eagles had high hopes for Matthews this year, and the talented rookie has found new life with Sanchez under center. Since Sanchez filled in for the injured Nick Foles, Matthews has racked up nine catches for 173 receiving yards and three touchdowns. If this rookie is still on the waiver wire in your league, don't waste another minute before picking him up. Bush avoided it for a few seasons, but he has been hit hard with the injury bug in 2014. He tweaked his ankle yet again last week against the Dolphins, and his status is in question for the upcoming matchup against the Arizona Cardinals as he didn't practice again on Friday. It's getting close to the time where you can drop Bush rather than have him take up valuable space on your roster with the fantasy playoffs looming. One of the people you might want to pick up if you drop Bush would be Riddick. He didn't do much last week filling in for Bush (aside from catching the game-winning touchdown), but in the previous two games when he filled in for Bush he averaged 6.5 receptions, 74.5 receiving yards and scored two touchdowns. He'll have lots of upside moving forward if Bush's ailments linger. Man, I really thought this was going to be Floyd's year in the offseason, and the early returns were pretty good, too. He had four double-digit performances in his first six games, but since then hasn't scored double-digit points in his last three games combined! It's not time to drop him yet, but his arrow is pointed in a downward direction with rookie receiver John Brown's emergence cutting into his targets and production. With Carson Palmer out for the rest of the year with a torn ACL, the Arizona offense is now under Stanton's control, for better or worse. Stanton was up and down in his three starts earlier this year, but I have faith in Bruce Arians' ability to mold this offense around Stanton. Give him a little time, but he could be worth starting for a few nice matchups during the fantasy playoffs. Hopkins has no shortage of fans among the NFL Fantasy writers and analysts (including yours truly), but we're not sure what to make of him or Johnson with Ryan Mallett under center. Mallett has a cannon of an arm, which could help spring Hopkins and Johnson deep more often. Of course, that cannon arm could also get him into turnover trouble as we've seen with gun slingers in the past. My gut tells me this move will be a good one for the fantasy value of these two, but we'll need to wait at least a week until they put something on tape with Mallett. Williams had a great chance to carve out a bigger role in the Giants offense with Rashad Jennings sidelined for four weeks with a knee injury, but he squandered that opportunity with mediocre play. Now that Jennings will be returning to his starting role, Williams' fantasy value for 2014 is plummeting. Rudolph should be returning to action for the Vikings in Week 11, the first time he'll be taking the field since Week 3. His backup, Chase Ford, posted 11 catches for 127 yards with one touchdown over the last two weeks, and plenty of those targets could drift to Rudolph if he is able to jump right back in as the starter. Make sure he's rostered in your leagues as he could provide a ton of upside once the fantasy playoffs roll around. Baldwin was the hottest name off the waiver wire in fantasy football after he racked up 123 receiving yards and a touchdown in the first game after the Seahawks traded away Percy Harvin to the Jets. Well, he's cooled off SIGNIFICANTLY since, watching his yardage output drop from 61 to 38 to 31 over the next three weeks. The Seahawks passing attack is a mess right now, and none of the pass-catchers in Seattle are worth starting at this time, including Baldwin. I don't understand why the 49ers don't give the ball to Gore more often. When they do, good things tend to happen. If Gore keeps his current pace with carries, he'll finish the season with 247 -- the fewest he's had in Jim Harbaugh's tenure with the 49ers. Hopefully the 49ers took note of how Gore helped spark the offense last week against New Orleans, and will continue to feed him the rock. He has a number of attractive matchups in the coming weeks, starting with the Giants this Sunday. After starting off the season on a torrid pace, Smith has slowed down to a crawl. He's failed to score more than seven fantasy points in five of his last six games, while Torrey Smith has reemerged as the top option in the Ravens passing attack. Hopefully Smith can use the bye week to get back to his dominant ways from earlier this season, otherwise his stock will continue to fall. Mike Evans has been a lot of fun to watch recently. Evans came into the NFL this season as an athletic specimen, but now that he's learning the nuances of playing wide receiver in the NFL and starting to run better routes, he's become a dominant playmaker. His arrow is pointing firmly upward right now, and I can't imagine it'll change direction any time soon. Sadly for Martin, he is a lingering memory from the past regime in Tampa Bay, and between his injuries and ineffective play the last two seasons his days could be numbered with the franchise. I have no problem with anyone dropping Martin in fantasy leagues at this point. There were many people I know in football media, including NFL Media's own Adam Rank, who had been crowing for Anderson to get more playing time. Well, thanks to Ronnie Hillman's foot injury that is now the case. Anderson might have to split some carries with Montee Ball and Juwan Thompson this week, but he has been far and away the most effective and explosive back of the bunch, so he could still produce fantasy-wise in Week 11. What a rough season for Cam. He's been battling injuries all season long, plays in an offense devoid of true weapons outside of Kelvin Benjamin and Greg Olsen and now has to run for his life every game behind a porous offensive line. This will be a season to forget for Cam and his fantasy owners. I couldn't write this column this week without giving a shout out to Rivera, who helped me in a pinch in my NFL Media Dynasty league! He's had 22 receptions for 175 receiving yards and three touchdowns over the past three weeks. The young tight end is developing quite a rapport with Derek Carr, and that could pay dividends for fantasy owners as the playoffs approach.